If this is the second time you're seeing this post, my deepest and most humblest of apologies. It won't surprise you to know that I'm an idiot, and accidentally published this on Monday. Then quickly unpublished it. And now here it is again, except the links might actually make sense this time since the post I'm talking about in this post has now been published. Confused? Yeah, me too. Clearly. One of my favorite Christmas traditions, without question, is terrifying small children into behaving themselves. Santa is great for this purpose, but obviously he can't be everywhere (except at EVERY SINGLE MALL), so he needs some help to effectively spy on all the kids. With assistance, he can more efficiently pass judgement, deeming children Naughty or Nice, dangling the proverbial carrot of holiday gifts out in front of them, threatening at any moment to yank away everything they've hoped and dreamed for in their young lives at the first sign of the slightest transgression. Or something like that. Ho, ho, ho! Enter Elf On The Shelf. He hangs around your house for months, magically appearing in a different spot every day, unless you're like me and forget to ever move him from his vantage point on top of the dining room hutch. 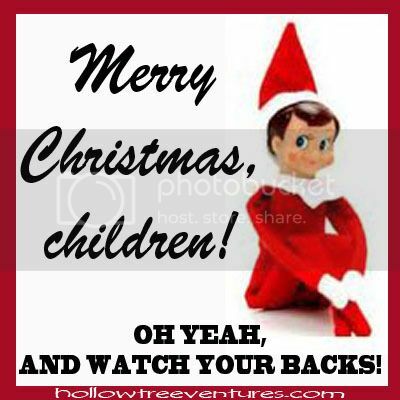 In theory, he keeps your children on their toes because you've informed them that Elf On The Shelf is watching their every move and reporting back to the Big Man himself. Win win! And by that, of course I mean you win with temporarily angelic children, and the elf wins, assuming he's voyeuristic and creepy (which they always are). This year, parents and elves are having even more fun! On the heels of Dog Shaming and Mom Shaming, may I present to you... (drum roll, please) Elf Shaming! And let me tell you, these elves have plenty to be ashamed of, because you know they get bored and start trouble. Especially my poor elf, who isn't even an elf. Squirrel the Elf is being featured today on Elf Shaming, and not just because he's too lazy to move from his original spot there on top of the hutch, which is causing my children to simply confine their misbehavior to everywhere on the planet besides our dining room. Head over here to read the shameful story behind how our squirrel ended up with his elfly duties. Then stick around over there to submit your own Elf Shaming pics (obviously they accept elves that aren't even elves, so don't despair if your Behavior Spy isn't an authentic Elf On The Shelf elf) for your opportunity to be featured for a day! And make sure you don't miss any of their disgraceful deeds by following on Pinterest, Facebook, Twitter, and even Google+! Wow, those elves really get around. A click below = one vote! That's all I want for Christmas, and I need your help because that damn squirrel is gonna ruin things for me with Santa, I just know it. Elf shaming, I like it! 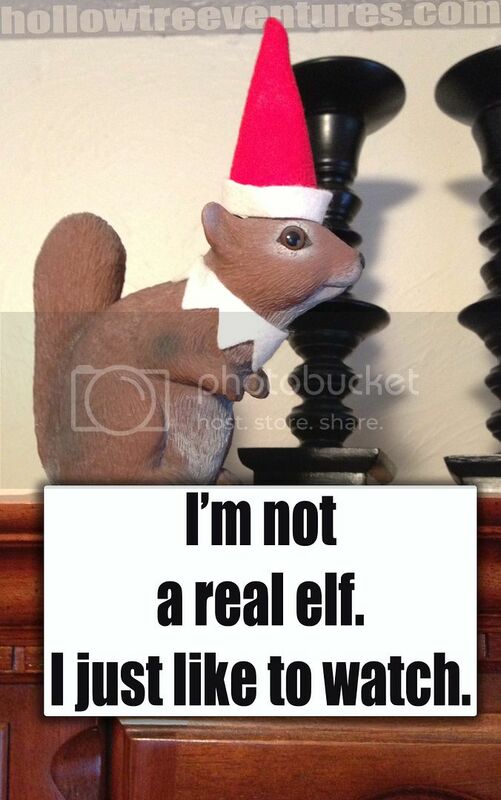 And Squirrel Elf shaming is even better. I just did a search for squirrel elf shaming and the first hit was some site called Hollow Tree Ventures that has a similar thing going on. They may have ripped you off. Hey, I replied to this yesterday, and now my comment's gone! Damn squirrel must know my password. Hey, I found my reply! I can't believe those jerks at Hollow Tree Ventures! But those jerks over at PCPPP are even worse - shaming those poor Sith Lords even though they have daddy issues. Oh no, wait, that's the Jedi I'm thinking of. See, it was worth the wait, right? I guess you have to click "publish" for this reply thing to work. I have not jumped on the Elf on the Shelf band-wagon yet. I prefer the old fashioned method of instilling fear of me in my children. but we do have a rather suspicious troll doll that I have no recollection of every buying, or receiving as a gift. I am certain he is up to something....I just haven't figured out his purpose yet. Watch him closely - and keep an eye on the kids, too. My daughter has now created a bunny elf, and SHE controls where it perches to creepily watch us.